I currently own two of these excellent cases for my custom L/R Mosin-Nagant’s. Both rifles have 26″ barrels . One stock M-N barrel cut back to 26″, with a MB&M 4 port brake , in a Archangel Stock , and the other is a M-N action coupled to a Kreiger .308 barrel . These rifles are 47-1/2″ and 48″ over-all , fit very nicely in this case . field abuse , and it has held up remarkably well . With zero negative effects to the rifle or scopes . In my opinion ; there is not a finer case available on the market for any big bore center-fire rifle . You can spend more ; but I don’t think you can get any better . That blows my mind they were selling that cheap. I bought this same case a year ago. It’s a $200+ product. I paid $125.00 plus shipping for the first one I got , direct from Plano three years ago , and paid $140.00 out the door at the local Big 5 , about three months ago . 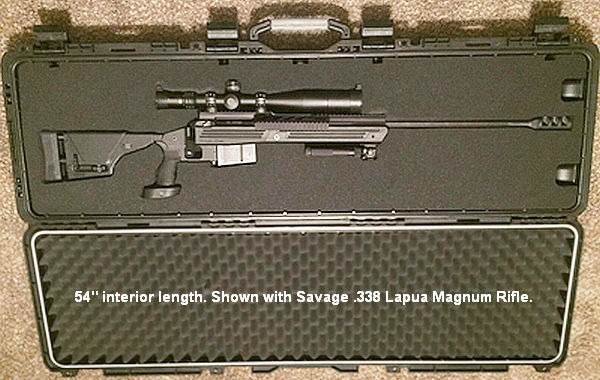 If you want a high dollar case for a long barreled Target rifle , this is the one . I’ll give it five stars , every time . TSA approved and vents , too . Excellent padding and can’t say enough good about this product . Also have the 42″ case of the same design for my Tactical-scoped SKS .